Wonder is one of those great films that everyone in the family can enjoy. The film, based on the book of the same name by R.J. Palacio, focuses on the young boy Auggie who had multiple surgeries on his face. In the story, Auggie faces the challenges of being among his peers who react to his condition in different ways. The movie stars Jacob Tremblay as Auggie, Owen Wilson as his dad, Julia Roberts as his mom, and Izabela Vidovic as his sister Via. Stephen Chbosky, who wrote Beauty and the Beast (2017) and The Perks of Being a Wallflower, directed the film. Wonder is expected to be available in digital formats including HD and UHD on January 30, followed by Blu-ray, 4k Blu-ray, and DVD on February 13, 2018. Bonus features on the Blu-ray combo editions from Lionsgate include the 5-part documentary “Summer of Fun,” a music video “Brand new Eyes,” behind-the-scenes content, and several featurettes. Each Blu-ray combo will also include either a DVD (Blu-ray edition) or Blu-ray Disc (Ultra HD Blu-ray) copy, along with a digital copy that can be redeemed via a code. 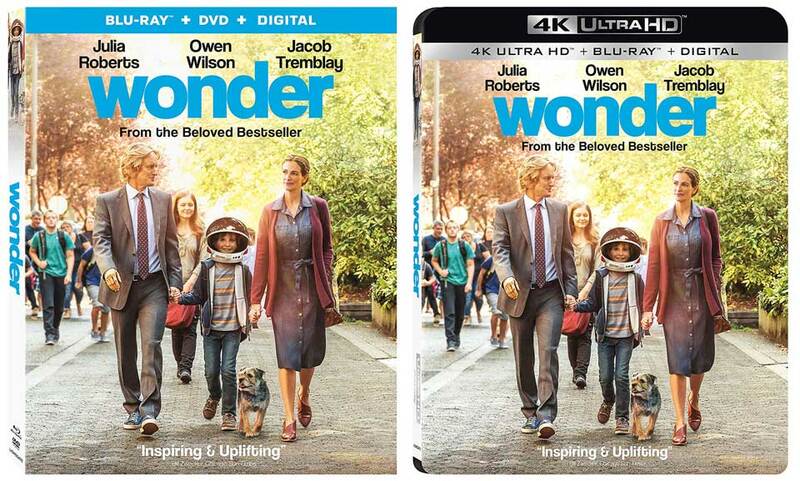 Wonder on Blu-ray has an MSRP of $39.99 ($18.86 pre-order) and the Ultra HD Blu-ray $42.99 ($22.96 pre-order). See updated Amazon prices below. Next Next post: Is Nintendo Labo Just For Kids?